Jonathan Sheppard is one of the best trainers horse racing has ever known, but his name is certainly not synonymous with the Kentucky Derby. Though the Hall of Famer has had a couple of his protégé saddle Derby winners--Barclay Tagg with Funny Cide in 2003 and Graham Motion with Animal Kingdom last year--he himself has never even had a runner make the starting gate. And that is not by accident. The 71-year-old Englishman is also a member of the steeplechase Hall of Fame and is one of only two trainers to handle both flat and steeplechase champions since the Eclipse Awards began in 1971. Best known for his distance turf runners, Sheppard has trained nine horses to 13 Eclipse titles. The two most recent were Forever Together and Informed Decision, who were also both Breeders' Cup winners. So for Sheppard to even to utter the words "Derby prep " is a bit foreign sounding to everyone, even Sheppard himself. But as they say, if you have the horse let him take you there, and that is exactly what Sheppard is hoping for with Ever So Lucky, who will make his 3-year-old debut Feb. 11 in the Hutcheson Stakes (gr. II) at Gulfstream Park. Ever So Lucky was purchased by Sheppard's main client, George Strawbridge Jr., for $600,000 out of the Fasig-Tipton Midlantic 2-year-olds in training sale last May. Bred in Kentucky by Jerry Jamgotchian, he is by Indian Charlie, out of the Summer Squall mare Bally Storm. Pedigree-wise, Sheppard is the first to admit that Ever So Lucky will be challenged to get classic distances, even though his dam side has some stamina to it. And he isn't even ready to say the bay colt is on the Derby Trail just yet. But for him to even consider races like the Hutcheson and the Florida Derby says a lot about the horse's talent. "We're obviously not going to rush this horse along to make the Triple Crown races, especially if we hit a bump in the road, but the Derby is a prestigious race and it's certainly a race I'd like to be part of," Sheppard said. "It's something I haven't done before and would be cool to do. 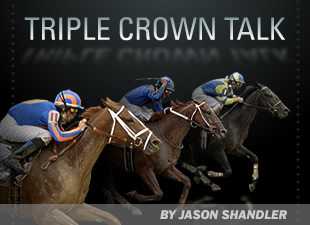 I've been part of all three Triple Crowns with the undercard races so many times that I know the scene pretty well. I enjoy it and have a fairly good idea of what it's all about. "With Graham and Barclay having won the Derby, maybe they have put the pressure on me." That last line was undoubtedly a joke, as Sheppard is one of the most patient trainers around. Ever So Lucky just happened to be an early-bloomer--as many Indian Charlies are--and has so much natural speed. He broke his maiden on the front end Nov. 11 in his debut at Churchill Downs, scoring by 3 1/4 lengths going 6 1/2 furlongs (video). A little more than two weeks later he finished a game second to the undefeated Gemologist in the grade II Kentucky Jockey Club Stakes over the same track (video). He was ridden by Julien Leparoux both times. After his juvenile season was over, Sheppard took him to the famed Camden Training Center in South Carolina where he had three easy breezes, and last week shipped him to South Florida. On Monday, he had his first work at Gulfstream Park, clocking a bullet :59 1/5 for five furlongs. Leparoux, who was aboard once again, was especially impressed by how easily the horse rated behind his workmate. Sheppard said it was a good fitness work, and is excited to see him start back in the seven-furlong Hutcheson. He doesn't want to get too ahead of himself until seeing that race, but has a tentative plan in the works should Ever So Lucky prove he deserves a chance on the Triple Crown trail. "I'd rather not empty the horse out by not asking too much too soon," Sheppard said. "I don't think he needs a series of long races; he's either going to get the trip or he's not. I think if you race him too long too early in the year I think it could take away from him. The Fountain of Youth comes back a little quick. The Florida Derby is six weeks (from the Hutcheson), so that would be something to consider. We also like Keeneland a lot. I know it's a synthetic surface, but he has already run well at Churchill Downs, so it's not like he has to get accustomed to that surface. So the Blue Grass Stakes might also be an option. "I do have some (distance) reservations in my mind, but the two things that give me hope that he might be able to go a mile and quarter are that he is willing to respond to what his rider tells him to do--even though he has a whole lot of speed--and he just has a ton of natural ability. So he might be good enough to carry his stamina a little further. "As they say, the single most important ingredient is speed. I don't care how many miles they can stay. They have to be quicker than the field at some point in the race--and he definitely has speed." Though Ever So Lucky has shown talent at every point in his career, Sheppard said it's his intangibles that separate him from other good, young horses he's had before. "He was picked out of the sale by Patty Miler of EQB," Sheppard recalled. "George Strawbridge called me the day before and said he was extremely high on him and wanted my opinion. So the morning of the sale I went down there. When I saw him I knew what we were getting. I had a long chat with Becky Thomas, who was selling him. I've known her for a long time and she gave me confidence. Everything added up. "We assumed he was (precocious) because of the Indian Charlie, and his fast work; I think he went :10 and 1 or something. But he didn't look like a one-dimension speedball ,and he still doesn't. He's one that wouldn't look out of place in the paddock at Royal Ascot. He's very high quality, and is a lovely, deep, almost heavenly colored dark bay. He has a lot of presence; a very intelligence look in his eye. He doesn't let anything bother him, which is the ideal temperament for something like Churchill on Derby Day." If the horse takes them there. "As much as we'd like to have a contender, we're not going to get bent out of shape about it," Sheppard said. "The world will keep going around whether we get to the Derby or not."